UNPO: HRC36 Side-Event: Freedom of Religion or Belief in 2017: A Dream for Unrepresented Nations and Peoples? HRC36 Side-Event: Freedom of Religion or Belief in 2017: A Dream for Unrepresented Nations and Peoples? On 14 September 2017, the Nonviolent Radical Party, Transnational and Transparty and the Unrepresented Nations and Peoples Organization (UNPO) organised a side-event to the 36th session of the Human Rights Council in Geneva, Switzerland. Bringing together victims and activists, this side-event, entitled “Freedom of Religion or Belief in 2017: A Dream for Unrepresented Nations and Peoples?” offered a platform for UNPO Members to discuss the significance of freedom of religion or belief as a human right. They also tackled the wide-ranging consequences of the systematic denial of this freedom by authoritarian or repressive regimes, based on their experience or first-hand accounts of persecution. UNPO Programme Director Mr Tommaso Nodari delivered opening remarks briefly introducing the cases of the Nations and Peoples represented during the event. While freedom of religion or belief is one of the core principles in international human rights, around the world, repressive governments fail to protect vulnerable communities and thus, many religious groups are disproportionately affected. Ms Mona Silavi, the representative of the Ahwaz Human Rights Organization in Brussels, Belgium, was the first to take the floor to raise awareness about the plight of her people; the Ahwazi Arabs. Ms Silavi underlined the State’s “one colour, one religion, one flag” policy, which she compared to that of China. Ms Silavi highlighted for instance that among the 380 prisoners of conscience behind bars in the country today are 250 Sunnis. Ms Silavi also seized the opportunity of her speech to raise awareness about the situation of Sabian Mandaeans. Since the 1990s, Mandaeans have been exposed to systematic violence at the hands of extremist and fanatic groups and have seen, for instance, their houses of prayer being destroyed. PhD candidate and chair of advocacy for the Ogaden Youth and Student Union Ms Juweria Ali then took the floor to deliver a speech focusing on the Ogadenis. In the region of Ogaden today Muslim populations cannot practice their religion freely, without being labelled terrorists by the Ethiopian authorities. To Ms Ali, the Ogaden being closed to the world, Ethiopian authorities can create their own narrative about what is happening in the region, using allegations of terrorism as a justification for cracking down on the liberation movement in the area. The chairman of the Khmers Kampuchea-Krom Federation, Mr Vien Thach shed light on the suppression of Khmer Krom’s freedom of religion or belief. 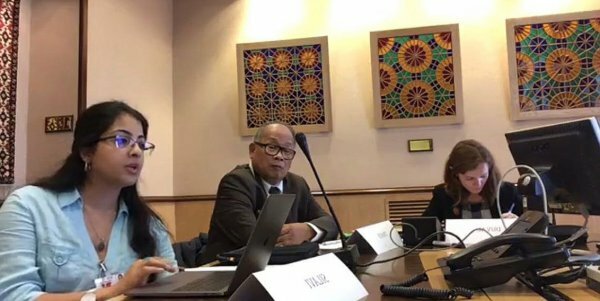 Although Viet Nam has allegedly initiated some steps towards improving the situation of minorities in the country by adopting a Law on Belief and Religion in 2016, the latter remains highly flawed and does not meet human rights standards. Theravada Buddhist monks are still today subjected to defrocking, arrests and torture due to their participation in protests or more generally to their activism. Mr Thach recalled the names of those arrested in the past years and reminded the audience that Venerable Thach Thuol, arrested in 2013, is still behind bars today. General Secretary of the World Uyghur Congress (WUC) Mr Dolkun Isa underlined in his speech the huge scale and great severity of China’s violation of freedom of religion or belief. The Chinese government, often under the guise of anti-terrorism laws, has taken increasingly harsh measures to enforce the One-China policy and to silence dissident voices, especially in East Turkestan. Despite article 36 of the Chinese constitution guaranteeing freedom of religion in the country, Isa underlined, Uyghurs continue to experience a ban on religious signs such as beards and the propaganda of the Chinese communist party has even entered mosques. Last, Ms Attiya Gamri, the President of the Assyrian Confederation of the European Union, addressed the audience to stress the precarious situation of Assyrians and their religious rights. Assyrians have progressively become the target of sectarian violence because of their distinct ethnic and religious identity. According to Ms Gamri, from 4 million in 2003, the number of Christians in Iraq has now fallen to less than one million. Assyrian churches have been bombed and members of the community raped, beaten and killed because of their Christianity.